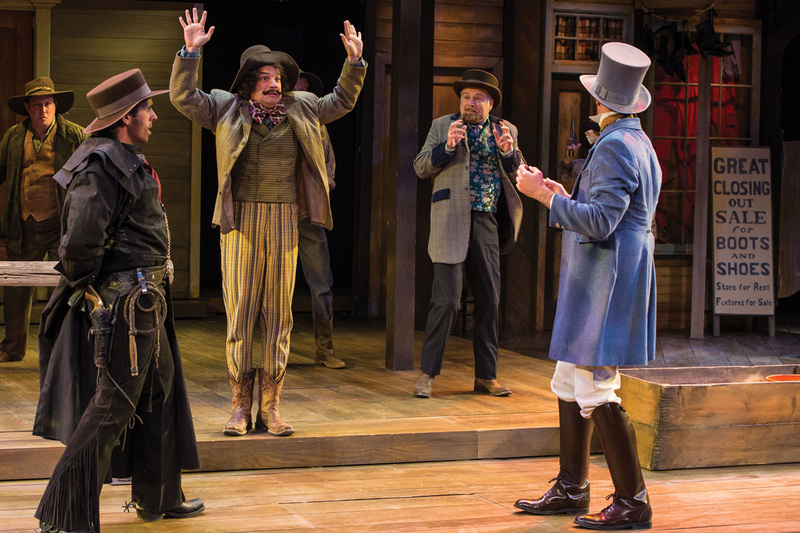 This year, unsuspecting visitors to the Utah Shakespeare Festival’s Adams Theatre may be startled to find Vicki M. Smith’s playful stage set, which looks more appropriate for a theatrical production of Blazing Saddles than an Elizabethan comedy: because at the 2014 Festival, Brad Carroll’s staging of Shakespeare’s The Comedy of Errors becomes a wild west romp that tumbles headlong into the mischief that ensues from mistaken identity. Shakespeare’s early play is a fairly straightforward comedy, the story of two sets of twins (masters and servants), separated during a shipwreck while young and ultimately reunited as adults. After the shipwreck, Antipholus and his servant Dromio establish themselves in Ephesus, where, as the play begins, Antipholus is a well-respected merchant. When the long lost brothers of both master and servant — also named Antipholus and Dromio — arrive in town, classic Shakespearean farce ensues as wives and merchants, prostitutes and nuns all take one brother for the other. One of Shakespeare’s earlier plays, The Comedy of Errors is also one of his shortest. But Carroll, with his inspired cast, takes full advantage of the available white space on the page to fill the stage with slapstick humor and mayhem. In the hands of this energetic crew (which enjoyed every minute of the opening night fun), the play adapts surprisingly well to its tumbleweed setting. The steel of a Shakespearean swordfight become pistols in an unwieldy shootout; a silver star transforms the all-powerful Duke of Shakespeare’s text into a swaggering, square-jawed sheriff; and the various townspeople — merchants, courtesans, constables — are morphed into a variety of wild west stereotypes. Cassandra Bissell and Eva Balistieri transform Shakespeare’s Adriana and Luciana into two versions of the southern belle: the wonderfully overheated Bissell is a fiery and passionate redhead, while Balistieri plays her sister as a curly blonde profile in retiring, sweet humility. The twangs and drawls of the cast are all over the dime-store spectrum, but the best comes from the full-throated, ACT V-delivery of Kathleen Brady’s shotgun-toting Abbess (who turns out to be mother to the Anthipholuses). Chris Amos and Drew Shirley do a wonderful job as the confused and frequently exasperated Antipholuses, but like two desperadoes running away with a bank haul, the two Dromios, Aaron Galligan-Stierle and Misha Fistensky, steal the show — especially Galligan-Stierle, who played his Syracusian Dromio with such gusto, he made even his costar burst with laughter. Shakespeare stays alive for us because he is constantly reinterpreted by new generations (also, well, because the words are just fabulous). His historical plays and tragedies are frequently adapted to other historical time periods — the age of fascism plays particularly well to his stories of tyrants — but it is less common to see his comedies so transformed. Carroll’s decision to place Ephesus among the tumbleweeds — the result of artist directors Brian Vaughn and David Ivers’ invitation to “think outside the box” — mines this comedy for plenty of comic gold and very few errors. The Utah Shakespeare Festival’s 2014 Summer Season includes The Comedy of Errors, Henry IV Part One, Measure for Measure, and Twelfth Night, running through October 18; as well as Sense and Sensibility and Into The Woods which run through August 30. The founder of Artists of Utah and editor of its online magazine, 15 Bytes, Shawn Rossiter has undergraduate degrees in English, French and Italian Literature and studied Comparative Literature in graduate school before pursuing a career in art.